Chris and I had been watching the weather channel pretty close to determine when we should swoop in and take down the tree. 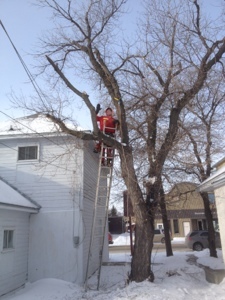 The tree had already shed some branches – somewhat inauspiciously on the roof of the house to the north. With a winter storm watch on, we wanted to make our move. Sandwiched between two houses – what could we do? 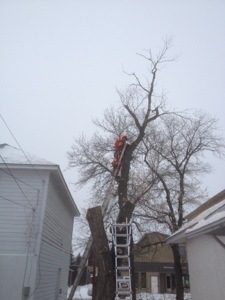 That’s right – deploy a system of pulleys and safety bring the ole girl down. 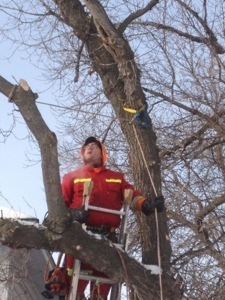 You can see Chris working safety through the three main branches. All in all — a fun day. It was cold – sure – but we got to eat taquitos and use all of our equipment. It all worked pretty good.